A few weeks prior to releasing their latest album, mō’zā-ik., Brooklyn band Phony Ppl spoke to TIDAL about the project and signing with 300 Entertainment. Their first album under 300, mō’zā-ik. is a collage-like LP with a myriad of stylistic influences. 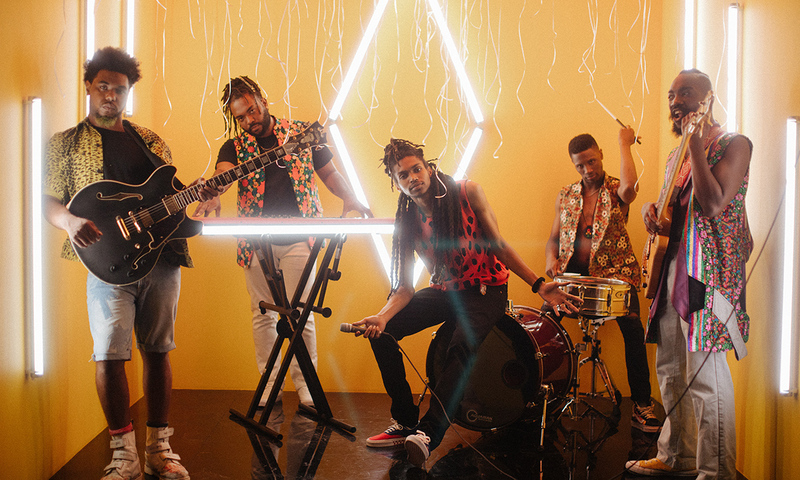 In the Q&A below, we hear from vocalist Elbee Three, keyboardist Aja Grant, guitarist Elijah Rawk, visual artist/bassist Bari Bass and percussionist Matthew Byas. Here, the fellas break down how the album represents their growth since their 2015 project, Yesterday’s Tomorrow, and why they’re proud of their nerdy nature. Elijah: This project is a culmination of a lot of time and a lot of changes and team additions and team losses and signing to 300 last year. We were playing with Kali Uchis for two years. All those things are why it took as long as it did, but we never stopped anything that we’re doing. We still see each other at least once a week. We all make music collectively and individually with other people. It’s not as much that we’ve changed, but it’s everything around what Phony Ppl is, so that’s what’s guided where we are right now and shaped where we’re going in the future. We already started working on the next album. All the systems are a lot easier. Matthew: All of us respect each other’s musicality. We know that in everybody, there’s so much to spread out and give. Just like with our genres, we like to make sure we can flourish and explore all different types of lanes and atmospheres. Everybody is free to just create music. Aja: We grew up with a lot of these people, so it wasn’t something we’d consciously think about. We’d just work with our friends and we would grow and our friends would grow and you just see where everyone is a few years later. A lot of the relationships that guide the work are personal. So, every song on this project represents a different vibe. Elbee: It just depends on where you’re at. Like, how I wanted this coffee right now. I might want some grapefruit juice later. I might want some hot sake with my guys. It’s just really about where you are. Aja: Before 300, every piece of video we ever had was done with friends and favors. There was a long period of nothing else happening. In general, we were at a loss with videos because we didn’t have the resources. 300 came, and this whole process has started over. Bari: Five different kinds of nerds. All around the board. We all have very focused interests. Elbee: It’s been a while, we’ve been talking about us touring, going out and doing our thing. We wanted it to make sense and didn’t want to do something that’s a split image of the demographic that we’re already catering to. I think in 2019 we might hit the road with us headlining.